I recently received an ARC copy of My Father's Paradise, courtesy of Algonquin Books (Thanks Lindsey). 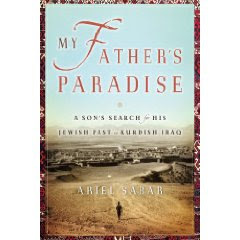 The author, Ariel Sabah, is the son of a Kurdish Jewish immigrant to the United States, and this is the story of family and his heritage. The story opens with the author's grandparents and their life in Kurdistan. A Jewish community had existed in Iraq for many centuries, speaking a form of Aramaic (the language spoken by Jesus). This Jewish community existed harmoniously with their Iraqi neighbours, as they had done for centuries, but remained largely illiterate and isolated from the outside world. We meet the author's grandparents and learn the story of their marriage and the tale of their lost daughter Rifka. However, as the the tensions of the 20th century eventually filter through to the remote town of Zahko, where Yona (the author's father) and his parents live. In the face of rising racism and intolerance, the Jews being to leave Iraq, fleeing to the fledgling state of Israel. More than 120,000 Jews left Iraq, making it one of the largest, and least known, diasporas in history. The tale follows the family to Israel, where they encounter more prejudice, this time from their Jewish brethren. The Kurdish Jews are considered backwards, rural and superstitious by the recent European immigrants to Israel. Yona, however, is determined to better himself and works hard to obtain a university education. It is here that his interest in his native tongue, Aramaic is sparked, and he begins his lifelong career, working to document the language. Eventually, he moves to America to study for a Ph.D. where he marries and raises a family. Yona never really returns to Israel, despite the wishes of his parents. He becomes an internationally acclaimed professor at UCLA, but his son, the author, is embarassed as a teenager by what he sees as his immigrant ways. As the author begins to raise his own family, he becomes interested in his own family's past and begins to research their history. The result is this fascinating and captivating tale. Father and son return to Iraq and Zahko and tensions between them are eased. But the author becomes obsessed with the tale of his father's lost sister and this obsession, which his father refuses to shares, begins to drive a wedge between the newly enhanced relationship between father and son. This was one book I found so hard to put down. The tale of the Kurdish Jews is largely unknown in history and this book serves to highlight a largely hitherto untold part of history. It is told with a personal touch, and it is heart touching to read about the author's story of discovery, both of his heritage and of himself. This is a powerful story and is bound to resonate with every reader.